Beneath a steely and frigid Minnesota sky, the warm orange glow of a greenhouse beckons me to enter. But getting inside requires special security clearance and the donning of a white Tyvek gown, and visitors must shower upon leaving. Scrambling up a snowdrift outside the glass building affords me a less encumbered peek at what’s inside: row upon row of wheat plants, riddled with a fungal pathogen that has destroyed countless hectares of the crop in Africa and, more recently, the Middle East. “There it is, Ug99,” says Brian Steffenson, a plant pathologist at the University of Minnesota, as he taps the glass to point out the dark-red fungus flecking the leaves of the young plants. As they grow, their stems will form large pustules of the fungus that will go on to shed pathogenic spores. Ug99 is a strain of wheat stem rust that was first identified in Uganda in 1998 (and named in 1999). By 2001, Ug99 began appearing in fields in Kenya; in Ethiopia by 2003; Sudan and Yemen by 2006; and Iran a year later. It now plagues wheat plants in nine African and Middle Eastern countries. Should the pathogen establish a global presence, 90 percent of wheat varieties could succumb, with whole crops flopping over and rotting within weeks or months of infection. The annual global harvest of some 700 million tons of wheat would be decimated. In late February, at the US Department of Agriculture’s Cereal Disease Laboratory (CDL) in St. Paul, Minnesota, scientists are wrapping up their busy winter season, hosing down a greenhouse and finishing up their analyses of rust samples sent from other parts of the world. The CDL is one of only two places in the world sanctioned to work with Ug99, and only for a few months during the cold season. Should the fungus escape the confines of the biosafety greenhouse, it would be met with the inhospitable environs of a St. Paul winter, leaving no chance of getting a foothold in North America. Most wheat researchers and breeders agree that to protect plants from Ug99, they must develop wheat varieties with several rust-resistance genes, so that if the fungus mutates to outwit one defense, there are others there to take on the pathogen. The problem is that it can take years to achieve this goal using traditional breeding methods. In the meantime, favorable winds could spread Ug99 even farther, and the fungus continues to evolve resistance to wheat crops’ natural defenses. Traditionally, breeders have introduced resistance traits into crops by crossing commercial plants with other wheat varieties or related taxa that are able to fend off a pathogen. Using this method, Borlaug successfully bred stem rust–resistant plants that thwarted other races of the once-devastating pathogen for four decades. (See "Wheat Whisperer, circa 1953.") Then, in 1998, scientists detected Ug99, a race of stem rust that had finally found a way around the crop’s main rust defenses. “The problem was [that rust resistance] lasted 40 years,” says Les Szabo, a geneticist at the CDL. As a result, governments became complacent in their efforts to breed wheat varieties with different resistance genes and to track how rust races were evolving. Stem rust became “a forgotten corner of plant pathology,” agrees Matt Rouse of the CDL. So when the pathogen reared its head again the late ’90s, it took the wheat research community by surprise. CIMMYT’s Singh was one of the first to become aware of Ug99 when it emerged in Uganda, and right from the beginning, he says, it raised big concerns. What was especially alarming to him at the time was that many rust-resistant CIMMYT varieties, developed with the traits Borlaug introduced, were vulnerable to the new race. “Even from 1998, it was clear we would have trouble sooner or later,” he says. While disheartening, such adaptations are not entirely surprising. Thanks to their large, dynamic genomes, rust species are extremely adept at overcoming host resistance to infection. And barberry—a ubiquitous shrub that serves as an alternative host to stem rust and often grows in close proximity to African wheat fields—might serve as a nursery for rust genetic diversity by offering a site where the fungus can reproduce sexually. Stem rust is so difficult to control, Singh has found that, on average, a single major rust-resistance gene becomes impotent just three to four years after it is introduced in the field. “Very rapidly, the genes we deploy [to protect plants against infection] are destroyed by rust,” says Dubcovsky. A more durable way to protect wheat against Ug99 would be to insert multiple rust resistance genes in a single variety of wheat—a process called pyramiding or stacking, and a technique that helped Borlaug’s wheat varieties withstand rust’s attack for so long. In particular, researchers are looking to stack multiple “major” or “seedling” resistance genes, which defend the plant against a specific pathogen at all stages of the host’s growth. (See illustration.) “The goal is to provide cultivars with more than one [Ug99] resistance gene, hopefully three,” says Rouse at the CDL. “It might slow down the virulence.” The stacking of major resistance genes can also be done in tandem with pyramiding “adult” resistance genes. These confer only partial resistance to an infection, but in combination can offer good protection against multiple strains of rust and are remarkably durable, often lasting for decades before being overcome by fungal mutations. WHEAT ASSASSIN: Stem rust can take out a healthy wheat crop within weeks to months of infection. The offending fungus, Puccinia graminis f. sp. 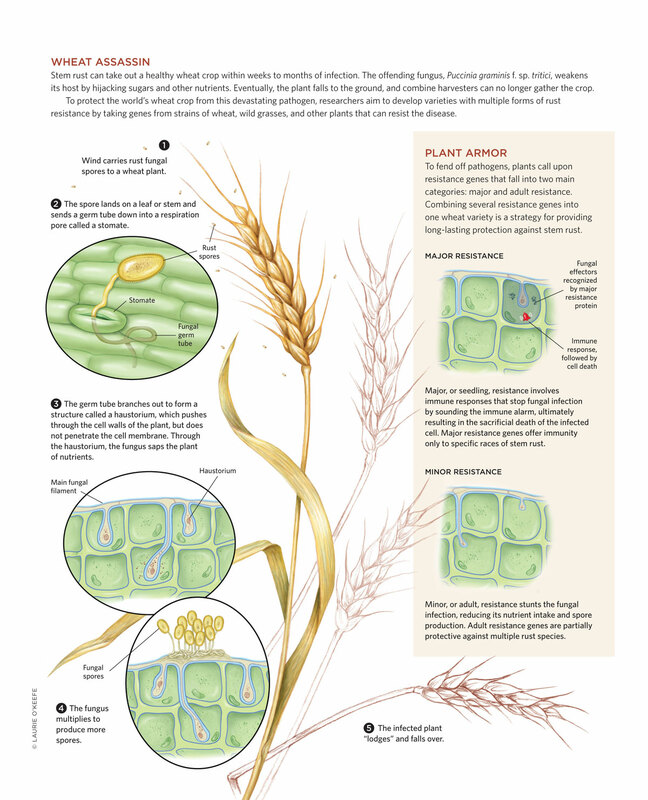 tritici, weakens its host by hijacking sugars and other nutrients. Eventually, the plant falls to the ground, and combine harvesters can no longer gather the crop. To protect the world’s wheat crop from this devastating pathogen, researchers aim to develop varieties with multiple forms of rust resistance by taking genes from strains of wheat, wild grasses, and other plants that can resist the disease. See full infographic: JPG | PDF© LAURIE O'KEEFEBut using traditional breeding strategies to pyramid resistance genes is time-consuming. In a typical wheat-breeding program, “from the first cross to the release of a variety, it’s about eight to nine years,” says James Anderson, the head of the wheat-breeding program at the University of Minnesota. And that’s just to develop a strain that carries one gene of interest. To stack three, four, or even five rust-resistance genes can add several more years to that time line. At CIMMYT, Singh and his colleagues have been working for nearly a decade to breed varieties that have multiple adult resistance genes. So far, they’ve succeeded in developing several Ug99-resistant varieties; two are being grown in Ethiopia and one in Kenya. While these new cultivars, especially the Kingbird variety in Kenya, offer decent protection from stem rust, yields from those crops are not as high as Singh would like, and CIMMYT continues to test dozens of other candidate varieties that might be more attractive to farmers. Both Sr33 and Sr35 are involved in recognizing the presence of the fungus and sounding the wheat plant’s immune alarm. (See illustration.) Dodds plans to use new gene-targeting techniques, such as TALENs and CRISPRs, to piece together both genes and others being cloned now into a single cassette that can be engineered into wheat plants. By inserting all the genes as a block—rather than as independent insertions dispersed on separate chromosomes—breeders can more easily select for those plants that carry the entire set. At the University of Minnesota, Steffenson is on a similar mission, traveling the world over to find traits in wild grasses that might be beneficial to farmers. He brings plants back to St. Paul and raises them in grow rooms just around the corner from the Cereal Disease Laboratory’s biosafety greenhouse where researchers experiment with Ug99. One room contains rows of goatgrasses (Aegilops sp. ), unremarkable-looking plants with a stunning ability to resist rust infection. In his analysis of one species, Aegilops sharonensis, Steffenson found that 82 percent of the samples were resistant to Ug99; 97 percent of plants of another species, Aegilops longissima, were resistant; and all samples of a third species, Aegilops speltoides, remained healthy despite rust exposure. “When you look at what wild crop relatives can contribute to cultivated species, it’s just a phenomenal amount of allelic diversity,” he says. Despite such enviable resistance, Aegilops grasses make terrible food crops. “We call it ‘the model nonmodel organism,’” says the Sainsbury Laboratory’s Wulff, who is working with Steffenson to understand how goatgrasses resist Ug99 infection. The goal is to isolate those defenses and bring them into wheat, while leaving behind Aegilops’ less desirable agronomic traits. Even if the researchers surmount the technical hurdles of isolating the resistance genes and inserting them into the wheat genome, they will undoubtedly face considerable hurdles in bringing the product to market. In addition to public resistance to GM crops in general, wheat faces its own particular challenges. Despite the public’s distaste for GM foods, especially in Europe, many genetically engineered products are already on the market. According to the International Service for the Acquisition of Agri-Biotech Applications, in 2013 the U.S. grew 70 million hectares of GM soybeans, cotton, canola, sugar beets, maize, and more. Brazil and Argentina together grew 65 million hectares of GM crops and Canada nearly 11 million. In total, some 175 million hectares of biotech crops, as they’re often called, can be found in cultivation around the world, and crops with stacked traits engineered into their genomes occupy an increasing share of that land—27 percent in 2013, up from 21 percent in 2009. Nevertheless, not a single GM wheat plant is approved for human consumption. Monsanto came close with its Roundup Ready wheat, engineered to tolerate the company’s Roundup herbicide, but widespread opposition among farmers and the public forced the company to abandon the project in 2004. The downfall for GM wheat has been a lack of a market, says Brett Blankenship, a wheat farmer in Washington and a vice president at the National Association of Wheat Growers. In the Pacific Northwest, for instance, much of the wheat grown is exported to Asia—Japan and Taiwan, in particular—where “they are resistant to the presence of biotech traits,” says Blankenship. If buyers won’t accept GM wheat, then farmers won’t grow it. University of Minnesota’s Anderson says GM corn and soybeans may have received more acceptance because they’re often processed or fed to animals, whereas most wheat enters the human food stream. Some consumers fear that tinkering with crop genomes could reduce the nutritive value of food, introduce toxins, increase the use of pesticides, or propel our already heavily-processed diets further away from what nature provided. The spread of engineered DNA to unintended targets in the form of crop-adjacent wild plants is another concern, highlighted by the 2013 appearance on an Oregon farm of Roundup Ready wheat—the very variety Monsanto had jumped ship on a decade earlier. Some GM-wary consumers also question whether GM crops actually deliver on the benefits that companies trumpet. Several months ago, for example, researchers reported that corn rootworm managed to topple Bt maize, a widely planted GM corn variety with supposed resistance to the pest. Opposition to transgenic crops may also stem from the fact that some GM plants, such as Bt maize, possess genes from bacteria. Singh says that one way to win over the heart (and appetite) of the public is to use wheat’s own genes to genetically engineer resistance—a process called cisgenesis—rather than bringing in genetic material from other taxa. But the prospect of GM wheat faces additional hurdles. Because the crop is regionally idiosyncratic—farmers in South Dakota use different varieties than those in Washington or Kansas, for instance—it is not possible to develop a single blockbuster variety that can be sold across the country. As a result, unlike corn and soybeans, which are primarily sold by agribusiness corporations, new wheat varieties for local farmers have primarily come from academic breeders, and universities can rarely afford the expense of regulatory review by the multiple government agencies that approve GM crops. “In the public sector, we cannot release transgenics because we cannot afford the regulatory costs,” says Dubcovsky. Nevertheless, GM wheat may still make its debut. In 2010, Monsanto announced that it was re-entering the field of biotech wheat and would work to genetically engineer crops that are higher yielding, stress tolerant, or herbicide resistant. In the U.K., scientists at Rothamsted Research are engineering wheat plants to produce an aphid repellent odor, (E)-β-farnesene, using a “gene gun” that fires DNA into plant cells. And this past March, India gave the OK to several companies to pursue field trials of genetically engineered crops, including wheat. Wheat growers are also starting to come around to the idea of cultivating GM plants. Several years ago, the National Association of Wheat Growers and US Wheat Associates expressed their support of biotech wheat. “We just have to prepare ourselves for a future where GM crops are more accepted,” Wulff says. 1. Y. Jin et al., “Detection of virulence to resistance gene Sr24 within race TTKS of Puccinia graminis f. sp. tritici,” Plant Disease, 92:923-26, 2008. 2. Y. Jin et al., “Detection of virulence to resistance Gene Sr36 within the TTKS race lineage of Puccinia graminis f. sp. tritici,” Plant Disease, 93:367-70, 2009. 3. S. Periyannan et al., “The gene Sr33, an ortholog of barley Mla genes, encodes resistance to wheat stem rust race Ug99,” Science, 341:786-88, 2013. 4. C. Saintenac et al., “Identification of wheat gene Sr35 that confers resistance to Ug99 stem rust race group,” Science, 341:783-86, 2013. 5. J.D. Zurn et al., “High-density mapping of a resistance gene to Ug99 from the Iranian landrace PI 626573,” Molecular Breeding, doi:10.1007/s11032-014-0081-8, 2014.